IMG_2733, originally uploaded by Lazy Seamstress. As Dressember approaches, I find myself stitching up skirts, when I really should be stitching up dresses, especially when I'm not sure how many of my current dresses even fit me! I cut these skirts out a few weeks ago, sometimes when I can't get to my sewing machine, I occupy myself by planning and cutting out in advance, then the cut out items sit patiently waiting for me to stitch them up....sometimes for quite a while. The skirt above and the one below are both made from the same pattern I used for my most recent wrap skirt. I didn't have enough of either fabric to make wrap skirts, so instead I cut out one front panel, and adding seam allowance to the centre back pattern piece, cut two back panels. 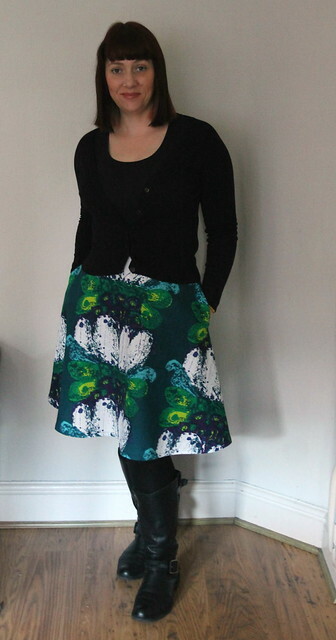 Both skirts have inseam pockets, (you might recognise the blue skirt from part three of the wrap skirt tutorial), and centre back zips, and both are finished at the waist with bias binding. 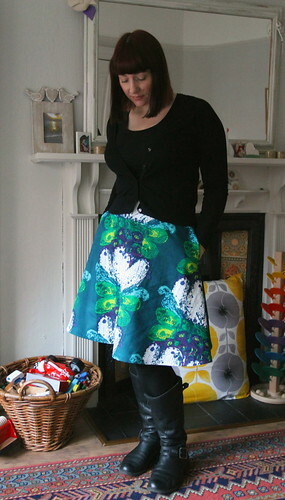 The border print fabric used for the blue skirt was bought at the Vintage Village in Stockport, and the bright print fabric used on the other skirt cost me £1 from a charity shop. Zips and all other notions were from stash. Neither skirt would stand up to close scrutiny by an experienced seamstress, but sometimes, that's ok. 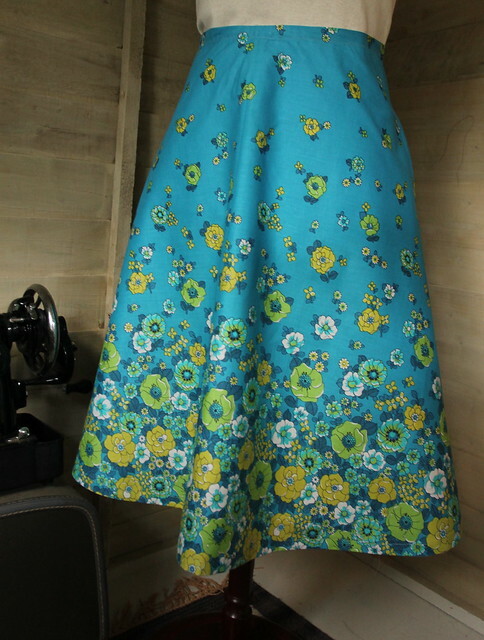 Sometimes, a day in my sewing shed pottering and not being too self critical, just enjoying the hum of the sewing machine is enough, especially if I get a couple of wearable skirts out of it. Even Woody noticed I was wearing something new this morning! Both skirts look great! I think we are always far too critical of our own sewing! We are, that's true, and you know I always confess all when I see you! The are lovely, I especially like the 2nd one (from the tutorial), which is possibly down to my age and remembering fabric like that when I younger lol. Your shed/studio looks fab by the way, I have been watching your progress on FB. Lovely skirts, so cheerful. You have have a haircut and a different colout, it looks lovely. Do you have to wear a different dress each day in December? Oh yes! I cut my hair, or rather I went to the hairdresser for the first time in about 18 months. I'm still getting used to the new length, and not really sure I like it, but it was so damaged from all the bleaching and colouring of late, there wasn't really any other choice. And no, you don't have to wear a different dress every day in Dressember, just a dress. Some people are even brave and wear the same dress styled a different way every day. I just love those vintage fabrics! That border print is gorgeous. Dressember? Id love to learn more!